Red and navy is a classic summer combination and is one of my favourites. This particular outfit made me think of sitting in a cafe in the French Riviera and I’d like to think that my pearl jewellery and the gorgeous ballerinas give an insouciant nod to Mme Chanel. As a woman with a very small business myself, I think it’s wonderful just how much difference other women make by sharing and supporting each others’ ventures. This freshwater pearl and heart jewellery is by Danon and is from my own online boutique Lizzy O. It is so beautifully made and very comfortable to wear and because every piece is hand-crafted (in Israel), every piece is unique. I’ve only recently bought these for myself and I know I will wear both the necklace and bracelet over and over. There is an option of a silver heart too. I love wearing heels, but sometimes, a pair of flats is unquestionably the right choice. The school run, travelling and sight-seeing are all more easily executed when not tottering. 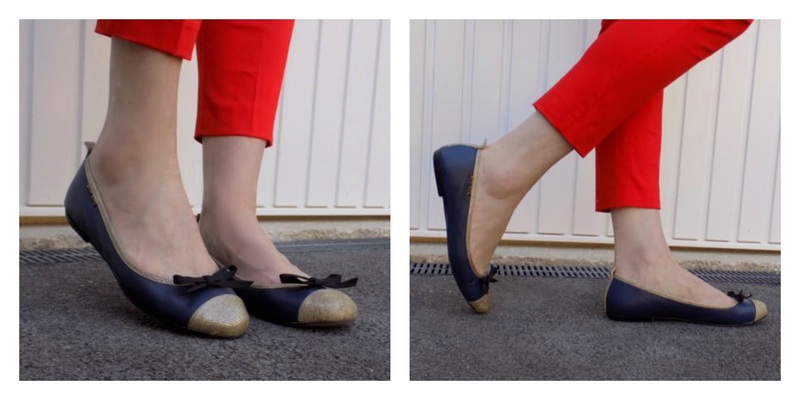 These all-leather ballet flats have a touch of French chic and are made by a family-run factory in Spain. They’re from small British brand Taylor Blake, a business run by working mothers Tracey Taylor and Emily Blake. They’re incredibly comfortable and so beautifully made and I couldn’t resist the textured gold detailing on this design, the “Copperhead.” Without doubt, they’ll become a wardrobe staple and looking at the array of colours, they may not be the only pair. The leather is soft and supple and the detailing is divine. It’s worth mentioning that the shoes will “give” a little. Mine felt ever so slightly small when I first tried them but they were perfect after wearing them for a few hours. So, if you’re in between sizes, I’d advise sizing down. (sign up to my monthly newsletter in the right hand sidebar of my blog for exclusive subscriber discounts for Lizzy O). Disclosure: My shoes were a gift from Taylor Blake. My trousers were a gift from Tu at Sainsburys. All opinions are 100% honest and all content is my own. I was not obliged to blog about these items nor did I receive any payment for writing this post. Thank you very much for supporting the brands that support What Lizzy Loves. Those ballerinas look fantastic Lizzie. The jewelry once again is real pretty and you cannot go wrong with a pair of red pants! I am all about supporting local businesses, too. You rock those red pants! I love it! And the jewelry is so unique!